Interview with Carl Finnigan conducted August 2010. Band photos courtesy of Carl Finnigan. In 1960, John F. Kennedy said, "We stand on the edge of a new frontier—the frontier of unfulfilled hopes and dreams." But for 16-year old East High sophomore Carl Finnigan, the new decade was anything but unfulfilling - he had been performing in country bands since the age of 11. "I played guitar from a very young age. I was playing in bars, but because liquor was sold, when the band took a break, I had to go outside and sit in the car until the break was over. Then an older band member would come outside and whistle for me to come back in the club and start picking the next set." 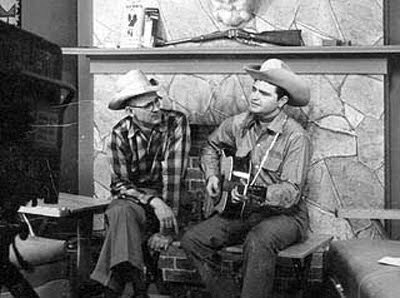 Finnigan was a featured artist with Buddy Johnson, who had a western music television show (the Pueblo Barn Dance) on KCSJ-TV (now KOAA-TV). 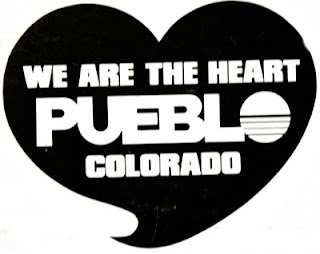 The pre-teen guitar phenom's professional resume also included regular gigs at the local Starlight Club, the Columbine, Silver Saddle, and the Caravan. Upon seeing him perform, country superstar Wanda Jackson wanted to hire him to go on tour with her. "But my parents said education was more important and would not allow it." Finnigan's family always knew he had a special gift. At an early age he would strum his plastic guitar to the music he heard on the Jimmy Cox radio show. "I always wanted a real guitar, so my grand-paw gave me an old Harmony model, and I was thrilled with it. I just started playing. 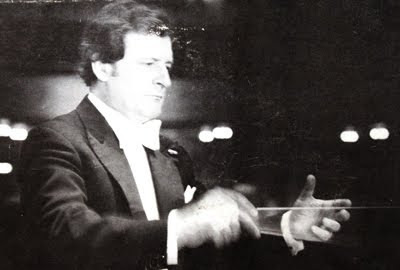 Shortly after that I got polio, and while in the hospital, I began to teach myself how to play." While he had been playing country music throughout his young life, he always had an ear for rock and roll. As a student at East, Finnigan began to recruit his friends for a new band he wanted to form. "One afternoon, while in the restroom at East, I began talking to my friend Gilbert Razo. I asked if he ever considered playing bass...and he said 'Not really.' But he had played a little guitar with his dad, and I said he could learn. Never playing bass before, Gil picked up an old used bass and I gave him a few lessons - he was a natural." For keyboards, he recruited 14-year old Larry Montoya, who had recently quit school. "Ronnie Houston was our drummer. He was had already graduated from Central, and I think he was probably about 22 when he joined the band." They dubbed themselves The Sting Reys. "Everybody named their band after automobiles back then," he said. "We just thought it would be a different take on the name instead of going with the exact spelling of the automobile. Plus we were concerned, and not exactly sure, if there would be a copyright issue." In spite of the less than legal ages of the group, they performed throughout the local Pueblo bar scene. 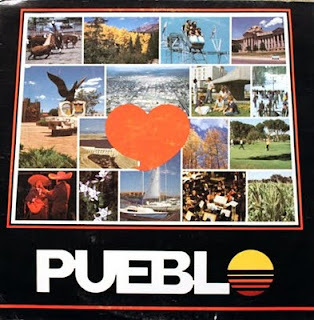 "We'd play at the Honey Bucket on Santa Fe, Quickie's Sugar Shack on Main, Ianne's/Pizza Hi-Fi Club in Bessemer, Jerry's Keg Room on 4th, Wayne's Sky Club, as well as in the Springs and Denver. My brother Arnold was the road manager, and we would travel in this 1956 Oldsmobile and pull a U-Haul trailer." 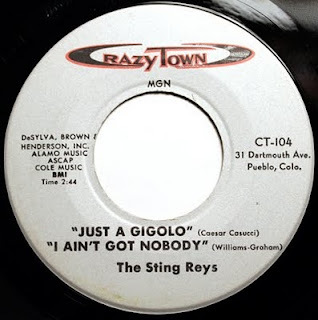 But unlike most local garage bands, the Sting Reys wanted to look the part of polished rock band, so they took a page from the British Invasion groups of the era, and invested in matching suits. 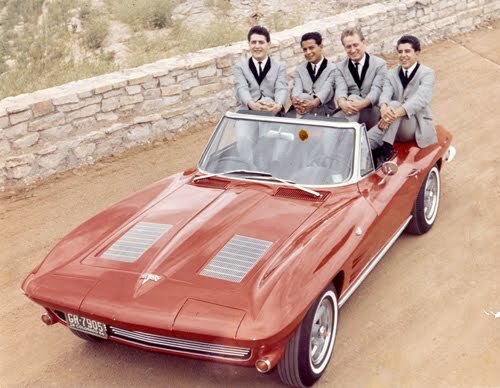 "We went to Joe’s on Santa Fe, and he had these catalogs where you could go through and pick out these suits. He had to special order them." Finnigan and the band then took the next step - they decided to record a single. "We were thinking about what to put on the record, and in the process of considering material we were thinking about Disneyland. That got us thinking about a different arrangement for 'When you Wish Upon a Star'." 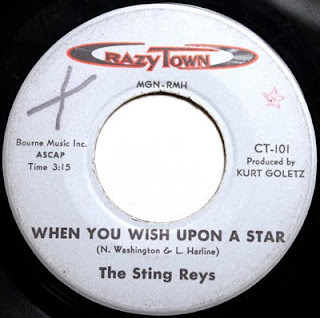 Listen to "When You Wish Upon a Star"
Recorded at Kurt Goletz Studios in Denver, and released in 1963, the single (Crazy Town 101) featured Larry Montoya on vocals. 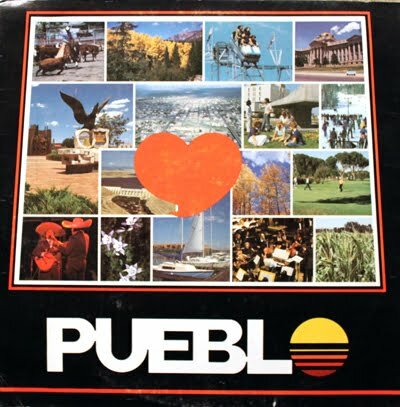 The Mike Novack produced record (along with the Carl Finnigan-penned instrumental flipside "You're Looking Good") received favorable reviews, and even reached up to #2 on a local El Paso radio station. Listen to "You're Looking Good"
"We had been booked in El Paso, and that's where we met Sunny and the Sunliners. We were on the same bill with the Bobby Fuller Four." The Denver sessions resulted in two other records, "Let Them Talk" / Alli Alli Auks in Free" (Crazy Town 102) and "Just a Gigolo (Ain't Got Nobody)" and the b-side, "Sick and Tired" (Crazy Town 104). 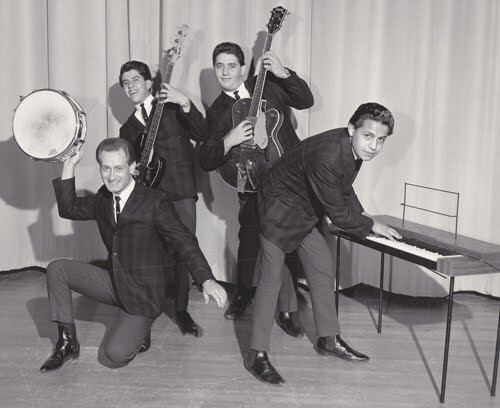 The band continued to tour, but by 1966 bassist Gilbert Razo was drafted into the service, and was headed to Vietnam. "We had been together about four years, and we had such a tight show worked out that we just didn't have the desire or drive to try and work with another bass player - it just wouldn't be the same sound." Larry Montoya would also leave the group, and join the Rudy Guiterrez Orchestra. Afterward he moved to Austin. According to Finnigan, he has since passed away. Ronnie Houston continued to play around town. He passed away last year. Gilbert Razo returned from Vietnam, and currently resides in California. Finnigan also moved to the West Coast, where he has found steady gigs working in various groups (including the lounge group Middle of the Road), and as a solo act. He has recorded three compact discs of vintage cowboy music for the band Old West. He is currently writing new music and recording in his home studio. Samples of his songs can be found at carlfinnigan.com.